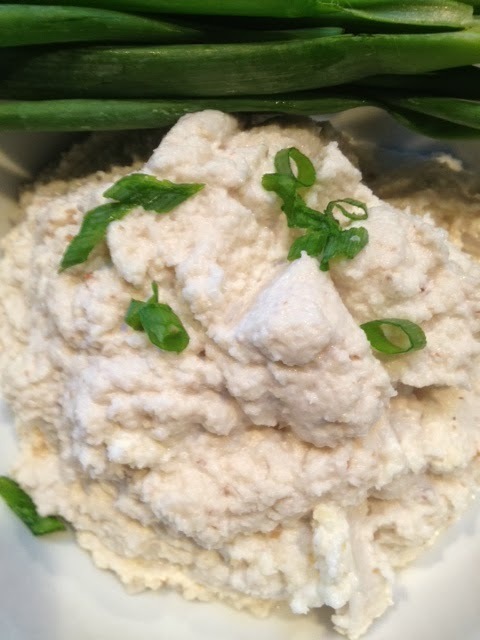 The flavor fresh steamed cauliflower is so mild that you’re able to pretty much control the flavor of your hummus with the spices you add. 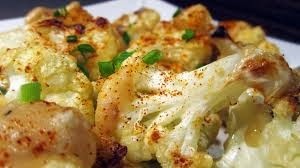 Have fun and make a spicy version by adding cayenne, or up the flavor ante with some extra garlic. Now, I did try it raw as well, and it was tasty, but not as creamy. Drizzle your finished dip with some olive oil and a pretty sprinkle of sweet paprika. Serve with sliced veggies, olives and homemade almond flour crackers. Half a medium sized cauliflower…no need to pare off the commonly seen little bit of brown on this vegetable…image below…that’s not mold, it’s oxidation and is rarely avoided when grown in the hotter months. Brown your hamburger, drain and set aside. Combine cauliflower and hamburger, then mix in crush garlic and Queso Fresca. I’ve always loved all things Winter Squash and have trialed numerous celebrated squashes in pursuit of the perfect squash, and I believe we may have found it in Sibley. Listed on the Ark of Taste, the awkward, strangely shaped bluish fruit lacks the qualities sought after in factory farmed produce. It doesn’t stack well. It offers nothing in the way of uniformity. It ripens slowly over a few months, instead of all at once. It’s not disease resistant, and the seeds are expensive. But the taste is sublime, complex, even somewhat nutty. 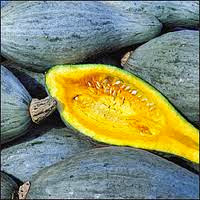 The unusual thing about Sibley, offered by a few heirloom seed companies, is that although it is a winter squash, meaning it has a hard shell and can be harvested and stored for later use…it can also be used like a zucchini when very young. 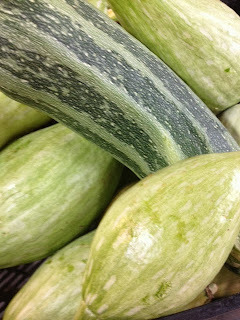 We’re growing Sibley and an heirloom zucchini, and are trying to put one or the other in all large boxes right now. I don’t think we could FIT a Sibley in a small box with everything else, although like I said, some Sibleys are huge and don’t fit in large boxes either…and occasionally we find one that is not much larger than a pummelo. Ark of Taste Project is a special listing of unique foods established by Slow Food, the food advocacy organization. They’ve catalogued over a 1000 unique foods that are labeled extraordinarily delicious and endangered, including Sibley. Here’s how I enjoyed the fruit this week with a friend for lunch: I halved the squash with a serrated knife, scooped out the seed (and saved it of course…Sibley is open pollinated so the seeds will come up true to type next year) and baked until soft at 350 degrees. I let cool to handle, and then spooned out the flesh into a Cuisinart with some low fat unflavored yogurt and a quarter cup of walnuts. I tossed in a couple cloves of garlic, salt, pepper and a quarter of a jalapeno for heat, and pureed. I reheated just before serving and once in bowls I topped with bread crumbs and shredded parmesan cheese, and used a kitchen torch to toast and melt the cheese at the table. Click on the link above for a list of the fruit we grow here on Morning Song Farm. We’re using dropbox for this link, it takes a second to download, but the resolution is better than gif files. OK, although the google upload thing worked for some subscribers last week, others said they couldn’t get the file opened to view our harvest tickets. A member of the public ( thanks, Ms. Leeds) provided another suggestion, which is vastly easier and I’m trialing this week. So I’m using her suggestion, Dropbox, this week, which provides a link you have to click, and then the PDF should open for everyone. Please do let me know if it doesn’t open for you! Tuesday’s boxes have radish sprouts. Like all brassicas, radishes have tiny, web-like hairs that to the uninitiated can certainly look like something funky…. say, mold. 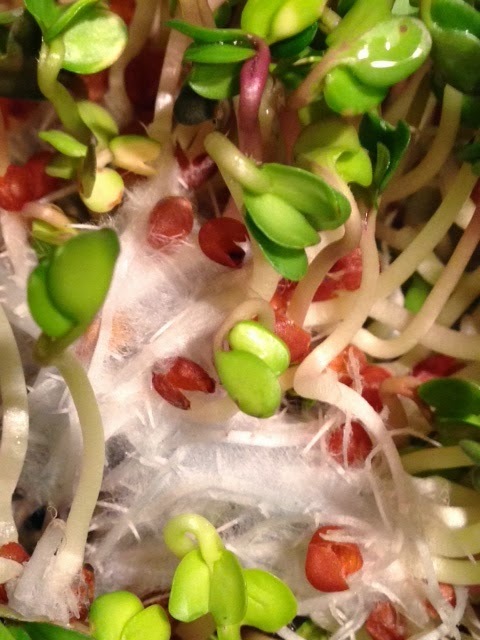 Here’s an image provided by a fellow subscriber last week (last week, Wednesday boxes received radish sprouts, this week they’ll receive our French Garden mix sprouts (which is a sprightly blend of clover, arugula, cress, radish, fenugreek and dill.) It’s quite a moving target to get a radish sprout that is both green but not over grown. Harvest too soon, and the sprout isn’t green; and harvest too late and the sprout is hotter than most peoples’ tastes. Facility temperatures can affect the growth rate so that as the weather changes, we are constantly adjusting the start day/hour to get a perfect finish. Even brassica (kale, radish, etc.) sprouts that are harvested a full day too soon will have tiny hairs and connecting webs of roots. It’s most noticeable with radish seed because radish is the largest brassica seed we sprout, so their hairy roots are just more noticeable to the naked eye. Because radish sprouts are definitely spicy, I enjoy using them on sandwiches in lieu of boring….boring….boring alfalfa sprouts. Of course sprinkling your raw salad with a dash of crunchy, spicy, radishes is a tasty choice, too! My kids also enjoy rolling radish sprouts in rice paper and serving as an appetizer with a offsetting mild-flavored dip. Well, after much knashing of teeth and tearing of hair out, I think I have managed to figure out how to get PDF files to download over to this blog, with the intent of making our Harvest Tickets easier to read and access from different platforms. Mind blowingly complicated considering the download mechanism (Google’s “Drive”) AND the blog software are both owned by Google. Really, there can’t just be a “download PDF” button? It has to require studying 11 pages of instructions downloaded off the internet, viewing a U-Tube video from an Indian IT guru dozens of times to figure out and HTML code management (here….I’m not kidding…this is from page five: “after copying the code go to Blogger.com..create a new post…select HTML Tab, and paste the code where you would like to see the document to appear. Now within the code that you pasted few moments a go (sic) search for /preview and replace it with /edit?usp=sharing….) Really? Feedback of the results would be welcomed. Can you access the files as I think you should be able to?